Lately, I’ve been struggling with some real and some imagined issues that come with aging. My body isn’t as strong as it used to be. I’ve developed pains and physical issues and sometimes I focus too much on these instead of trusting God to meet me in whatever situation I face. I was reading about eagles recently and discovered that they are the only birds that love the storm. When all other birds try to flee from the storm and hide from the fierceness of it, eagles fly right into it. They use the wind of the storm to rise higher and glide without using their own energy. They are able to do this because God has created the eagle with the unique ability to lock their wings in a fixed position. Later that morning, I had a dentist appointment. As I sat in the chair facing a large picture window waiting for the dentist to come in, I saw a huge bird with a large wingspan catching the current and gliding effortlessly back and forth. Although we don’t see eagles where I live on the coast, symbolically to me it was an eagle! It reminded me that it is possible to catch the wind of the Spirit, lock my wings in a fixed position of faith and soar—not in my own strength but in His! 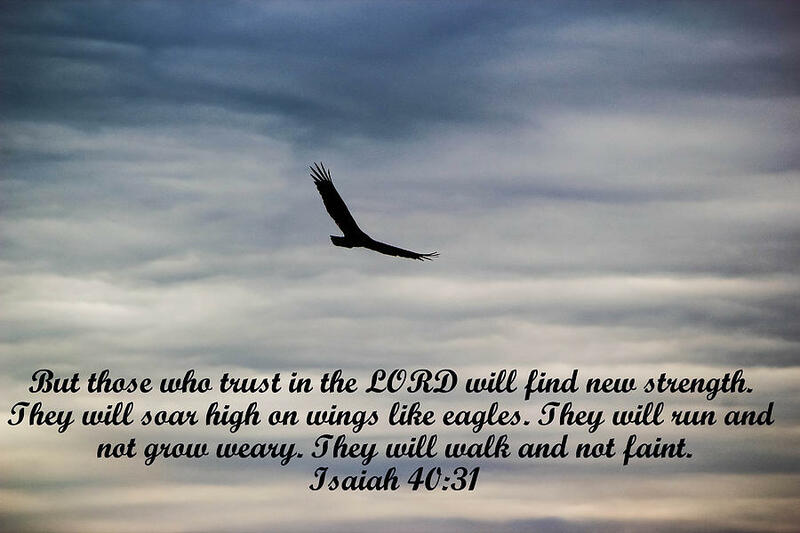 This entry was posted in God's Creation, Living the Christian Life, Meditation, Nature and tagged eagles, Isaiah 40:31, soar like an eagle. Bookmark the permalink.